Richard Scott donated a rare intact copy of a 1920s silent film, one of many in-kind gifts U of T received during the Boundless campaign. A dusty film canister tucked away for years. A curious father and his dutiful son. An intrepid archivist searching for forgotten treasures. A lost classic resurrected at last. It sounds like the plot of an amazing thriller, but the story of Secrets of the Night is very real. One of more than 7,000 films from the silent-movie era declared lost by the U.S. Library of Congress, the 1924 murder mystery resurfaced in 2017, in the only surviving complete print, with the University of Toronto playing a supporting role. The story begins in Winnipeg in the 1940s. A father returns home from work at an Eaton’s department store with a surprise: a 16 mm projector and 15 silent films from the store’s defunct film-rental library. Richard Scott remembers many a night when his family would gather in the basement to watch his father’s film treasures projected onto a bedsheet. Years pass. Scott grows up and moves to Mississauga, Ontario, bringing his father’s films with him. For 30 years, while film collectors search in vain for Secrets of the Night, the lone intact copy sits among the other 14 films in Scott’s Mississauga basement, waiting. 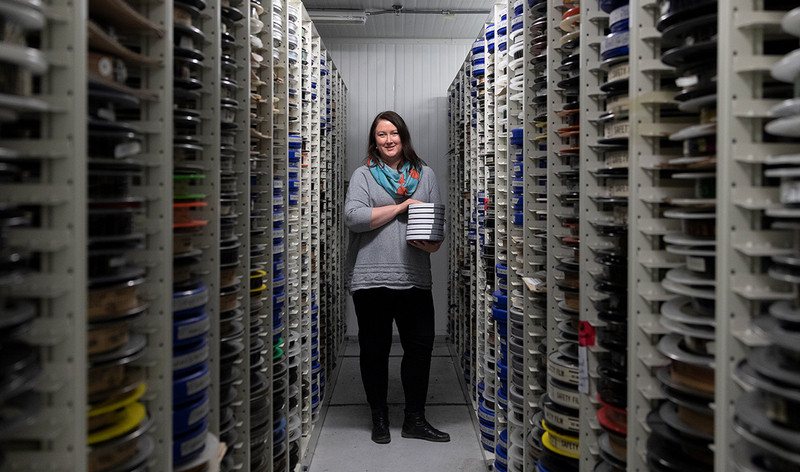 The films eventually found their way into the hands of Christina Stewart, Assistant Media Archivist at the University of Toronto Libraries’ Media Commons. Stewart quickly recognized Secrets of the Night and the special significance of Scott’s donation. “There is a 16 mm print of the film in a private collection, but it does not contain the original opening credits and is missing three scenes from the ending,” she notes. More than 90 years after its initial release, Secrets of the Night finally received its long-awaited second act. In March 2017, Media Commons staged a special screening of the film, fully restored, with live musical accompaniment. During the Boundless campaign, the University of Toronto Libraries received numerous gifts-in-kind. From rare and ancient manuscripts and consequential film collections to the archives of great Canadian authors and musicians, these gifts of goods and services – great or small- enrich our holdings and enhance our research and teaching mission. In the case of Secrets of the Night, for example, provides a deep understanding into film history and a valuable resource for many modern filmmakers.